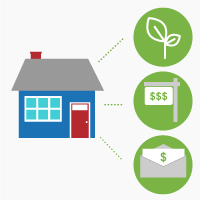 If you’re thinking of updating your residential HVAC system, why not go green? A renewable energy unit can heat and cool your home without depleting its energy source. A green residential HVAC system will keep your household at a comfortable temperature without burning any fuel or emitting greenhouse gases. At AAA Heating & Cooling, we can install a number of different types of renewable energy units that can accommodate the unique needs of your home. Renewable energy sources include a range of solar water heaters and geothermal heat pumps and come in a variety of sizes. Green HVAC systems are designed to be efficient, durable, and low-maintenance. AAA Heating & Cooling is ready to install a renewable HVAC system in your home that will save you money and keep your home at a comfortable temperature year-round. Most renewable energy units are easy to maintain. However, there is always a chance of malfunction or the need for repair. At AAA Heating & Cooling, we offer maintenance and repair services on residential renewable HVAC systems. We can help with any malfunction or general service for your home’s green energy unit. We also offer 24-hour emergency service. If you need assistance with repairs, maintenance, or installation, give us a call! If you’re on the fence about installing a renewable HVAC unit in your home, consider the benefits! The team at AAA Heating & Cooling can help you determine the best green HVAC system for your Portland or Vancouver home. For more information on residential renewable energy, contact us today!